The Lavender Experiment: Castile Soap is Awesome. So I've already mentioned the fact that I use castile soap alot to clean around the house, but I thought I'd add a bit more information on what I use it for and how I use it. It really is pretty cool stuff and I've successfully turned two of my sisters and my mum into castile converts over the past couple of months. Castile soap is traditionally a pure soap made using olive oil. It is entirely vegetable based (not animal products, such as tallow) and much gentler on the skin than more modern soaps. This is mainly due to the fact that castile soap retains its natural levels of glycerin, whereas commercial soapmakers remove the glycerin in order to sell it separately. Basically, it is super mild, very effective in cleansing and highly moisturising. It. Is. Awesome. I can tell you that I have used it as shampoo (no good for me at all - it was Stringy Town all over), hand soap, body wash, laundry, nappy wash and general cleaning. And apart from the shampoo debacle, it's been awesome. So read on if you'd like to see how you can use it. I use a front-loader, and add around 1/3 cup of the soap to the detergent dispenser for all my washing. I then add a handful of bi-carb soda to the same dispenser and about the same amount of white vinegar to the rinse dispenser. Works a treat every time. Plus, our clothes smell incredible. I actively sniff my clothes. Often. In public sometimes. 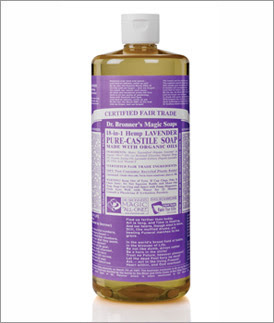 As a body wash and hand soap, Dr Bronner's Lavender Soap can't be beaten. The lavendery goodness is super relaxing before bed and a beautiful scent during the day. For hand soap I use just a normal hand soap squirty dispensery thingy and dilute the soap with water at roughly 1:1. This basically stops it from clogging up the squirty thingy. For body wash I use a cute travel-sized squirt bottle (for shampoos and the like) and dilute the soap with some water at roughly one part water to two parts soap. The soap is really concentrated so this just stops me from using too much and becoming a lather monster. As a shampoo, for me, Dr Bronners sucked. But I do have long, blonde highlighted hair, so probably not ideal. I even tried Dr Bronners Shikakai Conditioning Rins e to help with the tangly, not-quite-clean feeling, but that was just weird. And it didn't work. And it was full of brown lumps that looked a lot like poop. So back to Burt's Bees for me. And as for toothpaste... No. As a dishwashing detergent, just squirt some soap into your hot water as normal. It may not suds up as much though, but don't be tempted to use extra, as it will just make everything slippery. No good when washing priceless family heirlooms. Add it to your green cleaning recipes. A little (very little) squirt onto a damp cloth, combined with a sprinkle of bi-carb soda is a great benchtop cleaner. So there you have a little rundown of why castile soap is indeed awesome, and why I rave about it. Aside from the fact that it's organic and harmless to my family and our health, it's also really quite economical as it's super concentrated and you can use it everywhere. Which I do. Except on my teeth.